South Carolina Army National Guard Responds to Hurricane Maria in Puerto Rico October 2017. 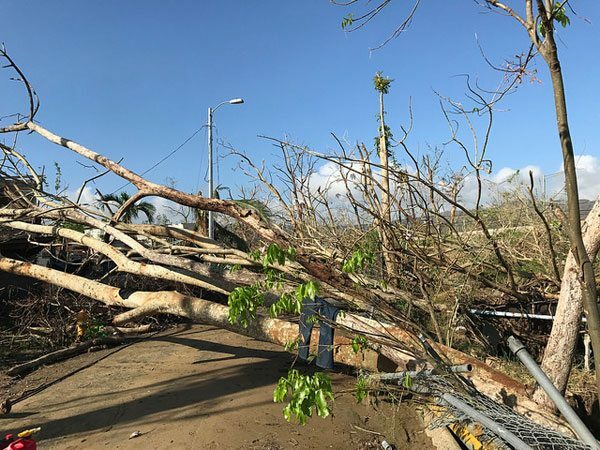 Since Hurricane Maria, NPQ has been covering the crisis in Puerto Rico. We saw a situation that we felt needed to be highlighted, full of warnings, learnings, and opportunities. As the island faces a near-total collapse of infrastructure—economic, political, communications, energy, transportation, education, health, arts and culture—nonprofits there are faced with the perfect crisis opportunity. Many nonprofits in Puerto Rico and the US have jumped into the federal political vacuum to answer the call for help. But what does this moment make possible for Puerto Rico’s nonprofit sector? This is something that others, including the nonprofit sector in the US, have a stake in, for we are facing increasingly similar crisis opportunities. This line of questioning is incredibly salient because the general conditions in Puerto Rico—increasing economic inequality and an attack on democracy—are reflected the world over. Further, even though funders may not currently have catastrophe portfolios, that may be changing. Places like Puerto Rico that are experiencing full-scale collapse are simply at the edge, experiencing it first. In Dmitry Orlov’s The Five Stages of Collapse: Survivors’ Toolkit, he proposes that current civilization has entered the collapse phase where, rather than long-term decline, we have sudden changes caused by systems out of control. Perhaps these moments are the new high-leverage points in systems change; when systems are collapsing, there is a vacuum and a battle for the new order. This month, I will go to Puerto Rico on a reporting tour to see first-hand how everyday people are holding it down and to connect you, the reader, to this opportunity to contribute to the building of a strong and thriving, and increasingly critical, nonprofit sector in Puerto Rico, and garner the learnings (and perhaps even partnerships) available for our own sector in the US. In discussions NPQ has had so far with Puerto Rican nonprofit leaders and their funders, we have discovered there have already been learning conversations between the island and leaders from Detroit and other US cities that have struggled with municipal bankruptcy. These crises may be precursors to a future in which we are called upon to experiment with more localized, self-reliant strategies in the midst of democratic crises. As we move into 2018, NPQ will feature what we are learning in Puerto Rico. Many of Puerto Rico’s social challenges are related to the island’s economic model and political positioning, the result of a long colonial history first with Spain and, since 1898, with the US. As Puerto Rico’s economy developed, it shifted from agriculture to intensive manufacturing and foreign investments. In 1976, the focus shifted to industrial pharmaceuticals and high technology, due to significant tax breaks to US corporations that ended in 1996. Since then, Puerto Rico has not had a coherent economic strategy. Neoliberal trade agreements and the rise of Asia as a major player have diminished Puerto Rico’s attractiveness as a manufacturing site. In 2005, Puerto Rico reached the point where its public debt had surpassed 100 percent of its gross domestic product. Further, because of the high level of integration between the economies of the US and Puerto Rico, the challenges faced by the mainland have further exacerbated the island’s economic problems. The US recession and the subsequent intensification of federal partisan politics have frozen funds that have been critical to Puerto Rico’s economic development, and no significant change is expected in this area. As a result of these economic and political changes, Puerto Rico’s economy has been contracting since 2000, losing about 200,000 jobs between 2006 and 2013 in an island of 3.6 million in 2013. (It’s closer to 3.4 million now due to economic and environmental migration.) This period has been characterized by an increase in social polarization and a decrease in economic mobility. While Puerto Rico may be seen as a homogeneous society, marked demographic and geographic differences exist on the island. The differences have been amplified by a mass migration of Puerto Ricans from the island to the US over the same period that was also demographically and geographically varied; many of those who have left are young professionals, resulting in an older population, and the western part of the island has been hardest hit by the exodus. The demand on direct service nonprofits has increased over this time, as they began to fill the vacuum left by the federal and local government. At the same time, funding to nonprofits has significantly decreased in response to fiscal austerities. Though nonprofits can be found across Puerto Rico’s municipalities, they are concentrated in the largest cities: San Juan (30.3 percent), Caguas (16.1 percent), Bayamon (13.9 percent), Carolina (13.4 percent), Ponce (13.4 percent), and Mayaguez (10.1 percent). Estudios Tecnicos Inc., Puerto Rico’s leading consulting firm, has studied the island’s nonprofit sector and published reports in 1996, 2007, and 2015. The reports focus on nonprofits that provide a direct social service to the population, such as sports and recreation (14 percent); education and research (10.9 percent); arts and culture (7.8 percent); economic, social, and community development (7.7 percent); social services (6.7 percent); and other services (10.9 percent). They exclude the health and education sectors because they are significantly different. By 2015, the study identified 11,570 nonprofits, almost triple the size of the previous phase. However, in response to decreased funding, the big organizations had become smaller after taking measures to respond to the economic crisis. The study also found a significant increase in community-based organizations, which were at 22 percent, or 1 in 5. In response to the austerities of the long-term recession, neighborhood committees grew across the island to respond to local needs. According to the study, Puerto Rico’s 2014 nonprofit work force was estimated to be 150,410. The sector experienced a reduction in employee salary between 2006 and 2014 of 10.8 percent. Seventy percent of Puerto Rican nonprofit revenues go towards staff salary, and the authors use salary change as an indicator of organizational budget change. It found that in response to the long-term recession, nonprofits were laying off workers—an average of 23 full-time staff for each of the 400 organizations that responded to a poll in the same nonprofit study. In fact, more than half of those organizations reported 0 staff in 2014. Further, the number of management staff positions were significantly reduced, at an average of three to one. More than half reported 0 management staff and three-quarters reported only one. An average of eight out of 13 employees were part-time. Volunteers play a significant role in Puerto Rico’s nonprofit sector. When converting the number of volunteer hours into number of full-time staff positions, Puerto Rico’s volunteer force equaled 23,633 positions in 2014. So, volunteers were the equivalent of an additional 16 percent full-time nonprofit positions. The aforementioned 2015 nonprofit report sought to position Puerto Rico’s nonprofit sector as a serious and critical stakeholder in the country’s service delivery. In doing so, it assessed its contribution and made a case for its cost-effectiveness and efficiency in providing social services. For example, it looked at the cost of nonprofit service delivery in comparison to government service delivery and found that the agility and local knowledge and relationships of nonprofits allowed them to deliver comparable services at significantly lower cost. In health-related services, for every $1 that a nonprofit spends, the government spends $7. For every $1 a nonprofit spends on an education-related services, the government spends $20. However, Ataveyra Medina Hernandez, Vice President of Movimiento Una Sola Voz (One Voice Movement), the island’s nonprofit network; Government Relations Director at Boys and Girls Clubs of Puerto Rico; and a leader of the team that commissioned the nonprofit study from Estudios Tecnicos, recently told NPQ, “Puerto Rico does not have a philanthropic culture. Most nonprofits have a very high percentage of government funding. In the case of Boys and Girls Clubs, 16 percent comes from private individuals and 84 comes from government contracts. This replicates itself across most nonprofits on the island.” Puerto Rican nonprofits tend to not be funded by US foundations because they are not considered domestic, and they are not funded by international development funders because they are part of the US, so they are heavily dependent on the Puerto Rican government for their revenues. Further, Cox, who is also a lawyer, told NPQ, “One of the difficulties of Puerto Rico’s nonprofit sector is the fragmented legal framework for the operation of nonprofits. We don’t have a public policy for the sector, but pieces everywhere.” There have been initiatives over the years to develop a comprehensive public policy that would integrate the different laws regarding the sector. The most recent effort, on which Cox worked, was in 2012. According to Cox, it was a very participatory process sponsored by Puerto Rico’s Department of State, which certifies and registers nonprofit organizations. The final draft of the policy framework was vetted by 1,000 participants at a public forum and included a new committee for advising the government on the role and function of the nonprofit sector. It was presented to the Puerto Rican legislature and approved by the commonwealth’s House of Representatives, but not considered by its Senate because it came at the end of the last administration, and the new one focused instead on integrating two government agencies that work with the sector. “The timing was not good. So, the resulting proposal is not in effect. Right now, we have an agency that is supposed to be in charge, but we still have a fragmented legal framework which makes it difficult for the sector to comply with the laws,” Cox said. In an economy that does not grow, where the government has a series of fiscal restrictions that does not permit it to assume economic and social initiatives, and that confronts structural changes, one can expect a surge in new social needs. Nonprofit organizations must necessarily play a more proactive role. When you have a government that was weak fiscally and structurally before the hurricane, and then after, the collapse of information systems, databases, even government employees not being able to go to their offices…the capacity to invoice and get paid was limited almost to 0. We had pending invoices up to $2 million dollars. Our credit lines were totally maxed. What we have, essentially, is an effort to address island-wide poverty with local, civic participation, led by fiscally unstable nonprofits who are seeking central government level participation in a country that is in the midst of an economic collapse caused largely in part by its inability to self-govern. It’s like being in a hall of mirrors where everywhere you turn, you see the reflections of the reality you are trying to escape. It is very tempting, especially when one is fiscally free-falling, to reflect the dominant paradigm. This can also happen when a sector is in the development phase, where it is trying to define and assert itself as a relevant stakeholder. The US nonprofit sector went through this in the 1980s during the War on Poverty. There was a lot of government funding to address root level causes of poverty, like marginalization, but the resulting political activity made the government nervous. There were attempts to push organizations to act within the dominant framework, so collectives and alternatives were frowned upon, and instead leaders managed hierarchies and access to seats of power. All of the work that the report recommends, and which the leaders we spoke with reassert, the completion of the formalization of the sector into coherent sector-wide laws and regulations. This can keep the sector very busy. It is an important strategy; a crisis like this creates opportunities. There are resources flowing, and nonprofits could be part of that or left out. The service providers do need self-determination and agenda-setting power. In this recovery period, many decisions will be made and priorities set. Who is going to set those? Washington certainly will. But even if Puerto Rican nonprofits manage to renegotiate their relationships with the Puerto Rican government, they could still be treated as subcontractors. It seems one way they can gain greater legitimacy in agenda-setting is by being a democratic voice for the people. What do the people want? Who else besides these nonprofits thinks they know what’s going on and what should happen? Are they holding regular, public meetings and sustaining an ongoing dialogue with the communities so that when they propose solutions, the communities and other nonprofits are aligned? Puerto Rico’s nonprofit sector must think practically about what it can set up for itself that helps it be more collectively than what it is as individual organizations. In addition to renegotiating its relationship with the government, it can build a robust local democracy that can change Puerto Rico from the bottom up. Luckily, a significant part of the sector is working on alternative solutions. These are the co-ops, the community organizers, and the institutes for a resilient economy. They have been working side-by-side with service nonprofits. Perhaps an island-wide alliance should be considered, a joining of strategies that combines meeting needs through service delivery and building a sustainable, people-centered agenda for the rebuilding of Puerto Rico. These crisis opportunity moments don’t wait for cycles of organizational development. What’s the most strategic thing that Puerto Rico’s nonprofit sector can do right now? And what is it going to take to make it happen? The moment is ripe; in the absence of effective governance, people are self-governing anyway. On October 11th, Community Foundation of Puerto Rico president Nelson Colón delivered a major address at the City Club of Cleveland on the future of Puerto Rico and the need for an equity-based approach to recovery.